Above is a farm with enormous potential and yet sadly, it stands idle. It remains this way for many reasons but mainly, because of a lack of aquafarming management skills. Remaining positive in an industry that has not seen a new venture for over thirteen years, this article focuses on the potential of one of the many underutilized farms along the eastern coast of Australia. This brief page article explains the Aquafarmer Fish Farm Model for Coral Trout production in Australia. It was at this farm that most of Aquafarmer's preliminary work into Coral Trout Culture was done. And it was in regard to feeding large crops that the research work into Whiting was also carried out. 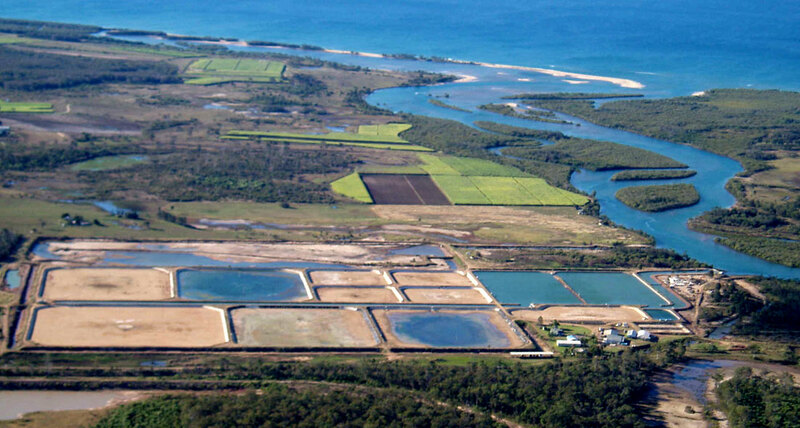 Aquafarmer considers this use of Whiting to be a major break through for land based fish farming in Australia. Here was and is a chance to bring many facets of aquaculture and aquafarming together. The Coral Trout breeding was successful and yet no high quality feed was and still is currently available. To make Coral Trout commercial on a commercial scale requires much more than successful breeding technology. Aquafarmer has long been an advocate of sustainable aquafarming and has always had major issues with the need to harvest wild fish to support aquaculture. It takes 3 kilograms of wild caught ocean fish to produce 1 kilogram of cultured fish. A figure which Aquafarmer finds totally unacceptable. Hence the research work into sustainable protein production and zooplankton. So to breed and growout three hundred to four hundred tonnes of coral trout required a different approach. Something radical by current standards and yet a method that should have been achieved twenty years ago. Whiting can be bred all year round. They are an opportunistic bottom feeder capable of alluding capture by cormorants. And they have many other qualities that make them very suitable as a high quality feed organism. So why not add live Whiting to the Coral Trout Culture? By-pass the traditional methods of pellet feeds? The answer is absolutely YES. This new method of high feed-chain polly-culture (HFCPC), I believe, is highly profitable. HFCPC is a massive departure from convention and offers many advantages based on the unique abilities of Whiting. Without going into species detail, the polly-culture nature alleviates considerable demand on pond metabolics and internal stability. As such the crop remains healthy and maintains high performance in quality and growth rate. The above farm has all the necessary parameters for continual support and yet it remains idle. Aquafarmer is searching for motivated investment to dynamically complete the above work and produce a new aquaculture species based on the following quick summary. This project will require support to firstly buy the farm and commence the commercial applications already well researched. Production is based on current market prices of wild Coral Trout landed at wharf of $56 per kilogram. For more in formation contact aquafarmer for a complete run down on any aspects.